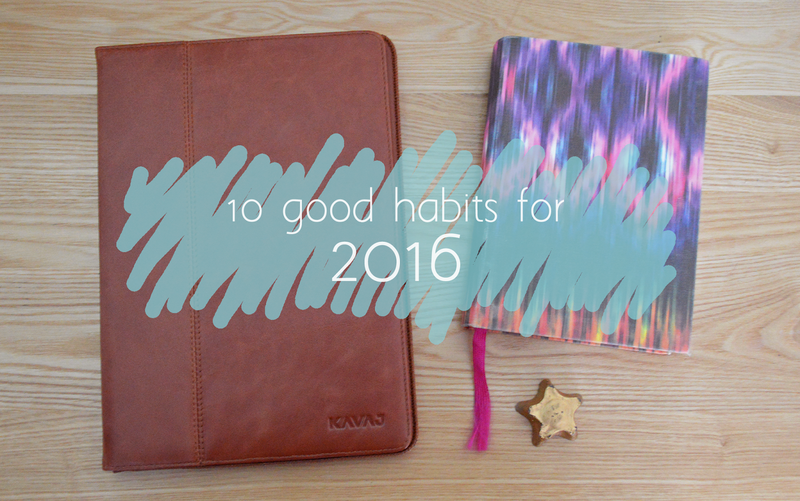 HelsYeah: 10 good habits for 2016! 10 good habits for 2016! I'm not setting New Year's Resolutions this year, as I'm convinced that as soon as you label something a "resolution" it is doomed. Instead, I've come up with 10 "good habits" that I'll be trying to stick to. Oh, and by the way - Happy New Year! Even though reading is one of my favourite pass times, I definitely don't make enough time for it. Right now, I've got a stack of about 5 books that I keep meaning to finish (or start) reading. This is something I've fallen out of the habit of doing recently. It doesn't have to be much, but even a few minutes of exercise every day can make a difference to your mood and energy levels. It's been gaining a lot of attention recently, and for good reason. Mindfulness is all about taking the time to slow down, notice how you feel, and just focus on your breath. It's a great form of stress relief (or prevention), which is perfect if you're a worrier like me! I don't mean a "dear diary" style journal, although that can be valuable too. We all lead such busy lives, I think keeping track of key dates, appointments, meetings etc is so essential. Personally, I like to have a physical notebook diary to do this in, although some people find calendar apps work just as well. Balanced being the key word. I'm a firm believer that treats and sweets are fine in moderation, as long as you're also getting your fill of fruit, veg, and all the important stuff. Be it abroad or within the UK, there's nothing I love more than exploring somewhere new. So, I've decided to embark on the #take12trips challenge, which you can read more about here. This is on a similar note to number 5. Like most of us, I sometimes let life get the better of me and don't manage to blog as often as I aim to. This year, I'm going to set aside more time to write and schedule posts in bulk. Checking my favourite blogs never fails to put me in a good mood, make me feel inspired, and even prompt ideas for my own blog. Sometimes I can get lost for hours jumping from blog to blog, but to keep this in check I'm going to set aside a few minutes each morning to flick through some blogs while I'm having breakfast. Again, I'm talking daily. At the end of each day, I tend to think about the things I've forgotten or haven't managed to do, more than everything I have done. So, I'm going to take just a couple of minutes every evening to list (maybe even physically write down) all the things that I have accomplished, even things as small as "tidied my room". Arguably the most important habit on this list. We can all be so self critical, and we tend to view a broken goal or "resolution" as a failure. In reality, beating ourselves up for one missed exercise session, or a weekend of unhealthy eating, can do far more damage than good. The best way to deal with such a situation is simply to acknowledge that it happened and try again tomorrow. No self-judgement. Now I just need to learn to follow my own advice! Have you set yourself any resolutions or good habits to follow this year? Let me know! Haha I couldn't agree more that the word 'resolution' is just asking for failure. I absolutely love #10 here. 2015 made me realise how important it is to always look after yourself and it's going to be my main focus in 2016 too. Nice post,these are very similar to mine. I have to agree with all these! I love mindfulness it's fantastic for helping with stress and to become more focused!